We all get things that happen to us unexpectedly, that’s a part of life. How we deal with the unexpected is what makes us unique & very individual. To be the best person in such situations, can the Tarot help? The quick and honest answer here is; yes, it can! The Tarot can show us options, give us advice on how to handle it, what to pay attention to & sometimes, even when to walk away. It’s often noted that the Tower/Blasted Oak is the card that says; curve ball! The unexpected hit & it hit hard. Not just a Cat 5 hurricane, but a tsunami & earthquake hit our lives somehow, or as it feels like, all at blooming once! You can stew on things for an age. Personally, I turn to the Tarot cards & see what they have to offer by way of advice & insight. I usually draw 3 cards, then expand on them if I need them. 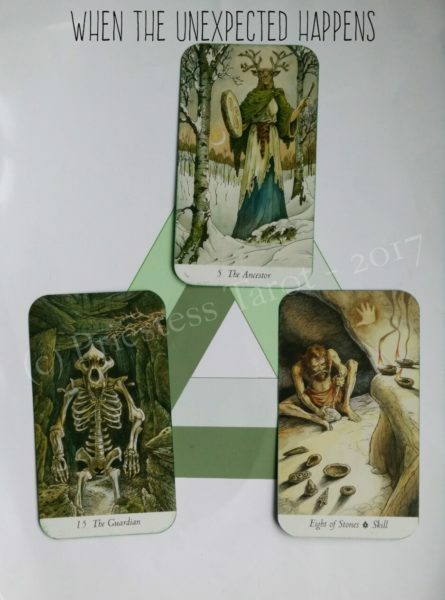 1/ The Ancestor shows that there’s strength in following your own path here. You already knew that things were needing to change, so now that they have, walk your own path & be aware of your surroundings. You’re at a gateway to the future you want, the positive is it’s a blank page. With the wisdom you already have, you can write this blank page as you wish it to be written. 2/ The Guardian shows that the negative here is your fear. It’s okay to be afraid. It’s not okay though to succumb to it & not do anything about it. This card is also about how you’ve gotten used to being. It’s amazing what you get used to being like, isn’t it? However, it is time to change & change yourself, your environment, your circumstances for the better. 3/ The Eight of Stones is an indication that this unexpected event isn’t a flash in the pan. The best thing you can do you here is work at it. It’s going to need some real change on your part, some effort, some hard work. The change will happen where you focus your energies. So keep your focus on your goals & what you want to achieve. It’s worth being dedicated for a short while, focused. Be yourself, your true unique self. You can say to others the magical word of “No”. It’s a complete sentence! You can go your own way. You often need to just do things for yourself but trust in yourself to do it. Fear isn’t about not being frightened, but rather, that something is more important that the fear. So what is more important to you? Work at resolving it. You may go around the issue a few times, chipping away at it as you go around, but that’s OK. You don’t have to do it all in one day or even two! Just a little each day will help! If you want to book your private Tarot consultation & want some help gaining insight and clarity through the wisdom of the tarot, you can do that right here.